This article comes from our archive, but we updated it with this video. Saturn is my absolute favorite object in the night sky. When I was a child, I had a dog-eared book on the Solar System, which I read over and over, stopping and staring with wonder at the section on Saturn. How could a planet have rings of ice? What would it be like to fly out and visit the planet, to see the rings with your own eyes. How did it get all those strange moons? When I was 14, I purchased my first telescope, a 4-inch Newtonian from a local company in Vancouver. It was summer, and one of the first planets, appearing just after sunset was Saturn. And my telescope had just enough power and magnification to resolve the planet and its famous rings. In fact, when I first looked at Saturn through the eyepiece, I couldn’t believe that I was now seeing the planet with my own eyes. It didn’t look quite like the photographs, but my imagination could fill in the gaps. From those first observations, my fascination with astronomy and Saturn only grew, leading me to a career in science journalism. It’s funny to think how far I’ve come, and how I can trace everything back to those warm summer nights, looking at Saturn. Think you know everything about Saturn? Think again. Here are 10 facts about Saturn, some you may know, and some you probably didn’t know. Saturn spins so quickly on its axis that the planet flattens itself out into an oblate spheroid. Seriously, you see this by eye when you look at a picture of Saturn; it looks like someone squished the planet a little. Of course, it’s the rapid spinning that’s squishing it, causing the equator to bulge out. While the distance from the center to the poles is 54,000 km, the distance from the center to the equator is 60,300 km. In other words, locations on the equator are approximately 6,300 km more distant from the center than the poles. We have a similar phenomenon here on Earth, where points on the equator are more distant from the center of the Earth, but on Saturn, it’s much more extreme. 3. The first astronomers thought the rings were moons. When Galileo first turned his rudimentary telescope on Saturn in 1610, he could see Saturn and its rings, but he didn’t know what he was looking at. He though that the rings might actually be two large moons stuck to either side of Saturn – ears maybe? It wasn’t until 1655 that the Dutch astronomer Christian Huygens used a better telescope to observe Saturn. He had the resolution to realize that the moons on either side of Saturn were actually rings: “a thin, flat ring, nowhere touching, and inclined to the ecliptic.” Huygens was also the first person to discover Saturn’s largest moon, Titan. Only 4 spacecraft sent from Earth have ever visited Saturn, and three of these were just brief flybys. The first was Pioneer 11, in 1979, which flew within 20,000 km of Saturn. Next came Voyager 1 in 1980, and then Voyager 2 in 1981. It wasn’t until Cassini’s arrival in 2004 that a spacecraft actually went into orbit around Saturn and captured photographs of the planet and its rings and moons. Unfortunately, there are no future plans to send any more spacecraft to Saturn. A few missions have been proposed, including such radical concepts as a sailboat that could traverse the liquid methane lakes on Titan. Jupiter has 67 discovered moons, but Saturn is a close second with 62. Some of these are large, like Titan, the second largest moon in the Solar System. But most are tiny – just a few km across, and they have no official names. In fact, the last few were discovered by NASA’s Cassini orbiter just a few years ago. More will probably be discovered in the coming years. Determining the rotation speed of Saturn was actually very difficult to do, because the planet doesn’t have a solid surface. Unlike Mercury, you can’t just watch to see how long it takes for a specific crater to rotate back into view; astronomers needed to come up with a clever solution: the magnetic field. To determine the rotational speed of Saturn, astronomers had to measure the rotation of the planet’s magnetic field. By one measurement, Saturn takes 10 hours and 14 minutes to turn on its orbit, but when Cassini approached Saturn, it clocked the rotation at 10 hours and 45 minutes. Astronomers now agree on an average day of 10 hours, 32 minutes and 35 seconds. 7. Saturn’s rings could be old, or they could be young. It’s possible that Saturn’s rings have been around since the beginning of the Solar System – around 4.54 billion years ago. Or maybe they’re relatively brand new compared to the age of Saturn. Astronomers still don’t fully understand the origin of Saturn’s rings. They might have formed recently, when a 300-km ice moon was torn apart by Saturn’s gravity, forming a ring around the planet. It’s also possible that they’re the left over material when Saturn formed in the solar nebula. The material in the rings might have gotten jostled by Saturn’s gravity, and never could pull together into a cohesive Moon. But astronomers have also found that the ring material looks just too clean to have formed so long ago, and could be as young as 100 million years old. It’s all just a big mystery. Well, they don’t actually disappear, but they look like they’re going away. Saturn’s axis is tilted, just like Earth. From our point of view, we see Saturn’s changing position as it takes its 30 year journey around the Sun. Sometimes, the rings are fully open, and we see them in all their glory, but other times we see the rings edge on – it looks like they’ve disappeared. This happened in 2008-2009, and will happen again in 2024-2025. Saturn appears as one of the 5 planets visible with the unaided eye. If Saturn is in the sky at night, you can head outside and see it. To see the rings and the ball of the planet itself, you’ll want to peer through a telescope. But you can amaze your friends and family by pointing out that bright star in the sky, and let them know they’re looking at Saturn. Not life on Saturn; the planet is way too hostile to support life. But there could be life on one of Saturn’s moons: Enceladus. 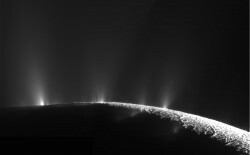 NASA’s Cassini spacecraft recently discovered ice geysers blasting out of Enceladus’ southern pole. This means that some process is keep the moon warm enough that water can remain a liquid underneath the surface. And wherever we find liquid water on Earth, we find life. 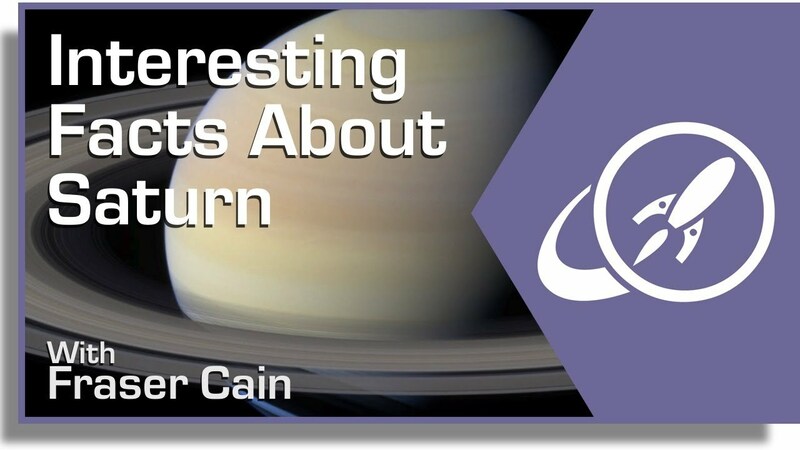 Want to learn more about Saturn? We’ve recorded two episodes of Astronomy Cast just about Saturn. The first is Episode 59: Saturn, and the second is Episode 61: Saturn’s Moons. This is a great website for me. It helped me get an A+ on my last Solar System project and my homework on planets due tomorrow. this helped a lot. thank you so very much. i have a report due tomorrow and this was needed. thank you. this helped a lot. thanks i have a report due tomorrow and this has helped me alot!!! thanx so much! i neede sum interesting facts bout Saturn! this is the best website for a project! this helped me with my science project!!! This helped a lot with my homework.